Up to this day, Roman military tactics are still learned in staff colleges and military schools like Sandhurst. 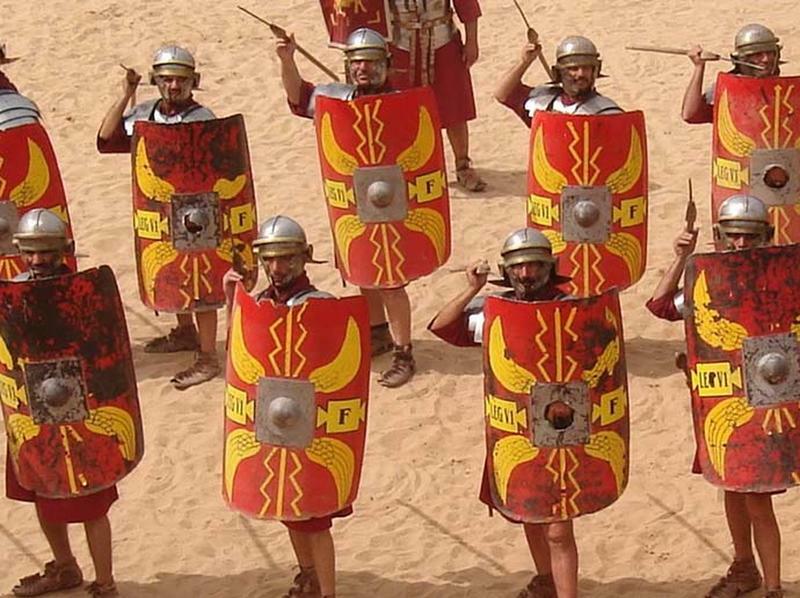 These organized military tactic and strategies predated the Romans. Event the formation in which they arranged themselves in a rectangular formation to fight was borrowed from the Greeks of Macedonia, with little improvements . 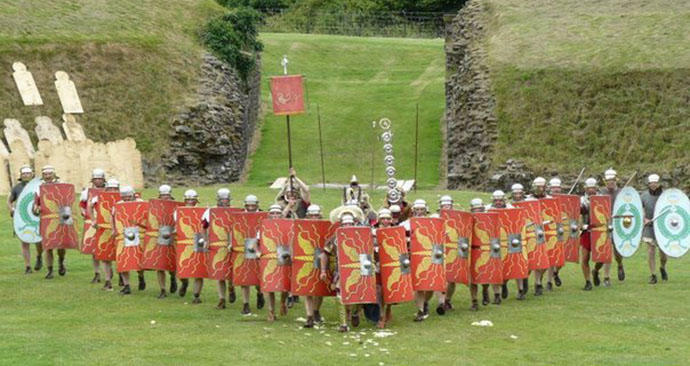 Even though the Romans brought this organization to a new extent, uniformity of their training and equipment was the key to their success. Every soldier is required to learn a short list of terse commands. Re-enactors demonstrating a testudo formation. It was named after the “tortoise” formation, which allowed them to display a 360-degree wall of wood to their opponents using their large scuta or shield. Over a meter in height, the front rank of the formation would kneel next to their interlocking shields. The next rank would hold their shields on top of the men’s head in front, and so on. If additional protection was needed, men at the rear and on the flanks could also form and locked their shields together. Forming an excellent missile barrier with their sharply curve fronts. Some descriptions of the roof of the tortoise discriminated between a lighter troop with flat shields, or “heavily - armed” infantry with curved scuta. A testudo travels appropriately like tortoise speed, and the formation was commonly used to defend distant missile attack. It was actually deployed in sieges, to provide the troops and engineers protected access to the walls they wanted to destroy before many of permanent defensive structures could be built. Marc Antony, of subsequent Shakespearean fame, successfully used the testudo with mounted archers against the Parthians, in 36 BC. 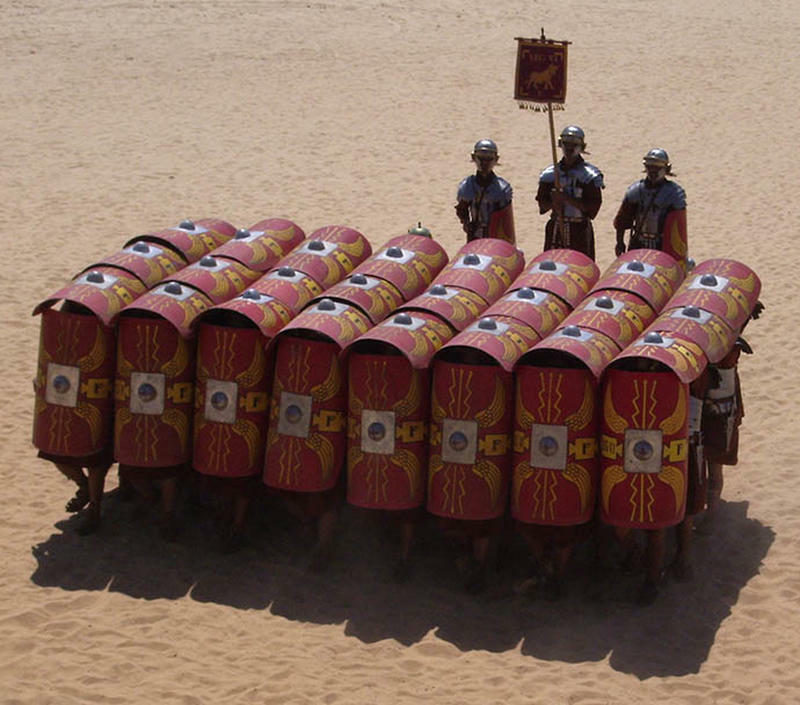 The Romans introduced one of the innovations on the Greek phalanx - a 3-lined formation of three different ranks. Military rank was the key to where a soldier stood in the battle order. Standing up the front rank was the least seasoned men, the hastati. Behind them were the principes and lastly, the triarii, the combat veterans. In front of them all, stood the newest and poorest, unfortunate velites, who would firstly throw javelins at incoming enemies before taking their post behind the triarii. The three lines would usually line up - the battle formation could be a mile long - with alternating gaps that presents a wider but visibly intact fighting front. These gaps gave more advantage that allowed the rear ranks to step up into a threatened line and create even more space for movement. The Roman army was really the ancient world’s master of movement formation, with different pre-drilled movements ready for execution at the general’s command. On the battle field, “Cuneum formate” or the legionaries would form a wedge and charge at the enemy. The “point” of the wedge would be composed of their best troops, allowing them to penetrate against a weaker enemy. This mismatch of blades allows the wedge in and forces a gap that can be widened by rest of the troops against an enemy that is being compressed. The wedge was frequently used. At the Battle of Pydna in 168 AD, the wedge attack helped greatly to end the empire of Alexander the Great of Macedon. And in the Battle of Wattling Street, In the Battle of Wattling Street, after successfully stopping a British charge with spear volleys, the outnumbered Romans advanced in wedge formations to put a stop to Boudicca’s great revolt in 60 or 61 AD.